Many homes and businesses in the Bay Area have had to deal with water damage at some point and it is important to react immediately to any water damage before giving it a chance to spread. There are many potential causes of water damage from weather conditions such as heavy rain, flooding, and humidity to internal issues including leaks, burst pipes, and sewage backups. Once the water damage starts, it will only spread further through porous building materials unless it is removed. ServiceMaster Disaster Recovery and Restoration provides water damage restoration services in Sunnyvale, CA to remove excess water and moisture to prevent more extensive structural damage and mold growth. 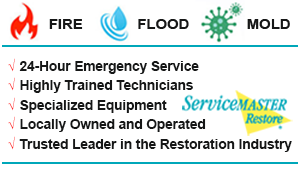 Our technicians are trained and certified to provide effective water damage restoration and flood cleanup and with over 35 years of combined experience, we can restore water losses of any size for homes and businesses. We are dedicated to completely removing excess water and moisture from the air spaces, furnishings, and structural elements of the building with our state-of-the-art drying equipment which includes floor mat systems, air movers, hydroxyl technologies, and dehumidifiers. Removing the moisture as well as any standing water from the building will help prevent mold growth as well as serious structural damage. We can also include other restoration services such as carpet and upholstery cleaning or content cleaning and pack-outs if they are needed. Do not use a household vacuum cleaner to remove standing water. Avoid using any electrical appliances while standing on a wet floor. Turn off the electricity before walking into rooms with standing water. Permanent carpeting should be removed by professionals who can do it without causing additional damage. Water damage can become a more serious problem by causing severe structural damage and mold growth so call ServiceMaster DRR as soon as you notice a problem. Sewage backups are the most difficult form of water damage to deal with because they can cause significant damage like a typical flood but contain viruses and bacteria such as hepatitis and E. coli. If you have a sewage backup in your home or building, it is best to avoid the damage to prevent negative health effects and contact ServiceMaster DRR. We can safely remove sewage backup and the dangerous substances it contains and we will also restore and sanitize the area so that you and your family can use it again safely. 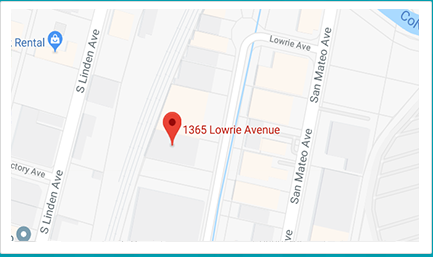 Water damage should never be ignored, even if the damage seems minor, so make sure to call ServiceMaster DRR for water damage restoration services if you are dealing with excess water or moisture in Sunnyvale, CA. We arrive within 1-2 hours of your call to effectively contain the damage and get the restoration process started. Our phone lines are open 24 hours a day at (800) 439-8833 to respond to water damage emergencies in Sunnyvale, CA area.